The risk of a pedestrian accident has never been higher, especially in Florida. But what causes it? Distraction is one of the primary factors to blame for most accidents, but it's not just driver distraction, as a new report from the Governors Highway Safety Administration notes. With technology at its peak, pedestrians have developed the dangerous habit of keeping their eyes on phones and games instead of the road ahead of them. 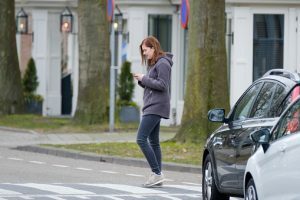 In Florida's Contributory negligence rulings, a distracted pedestrian may be to blame for an accident they're involved in. However, it does not mean that they cannot recover damages. That's because in this state, we recognize a system of comparative fault, as outlined in F.S. 768.81. What this means is in a negligence lawsuit, the fact of a plaintiff's own role in causing an accident isn't in and of itself grounds to bar recovery. It will, however, reduce one's damages by the degree to which their fault played a role in the accident. So for example, if a jury awards a pedestrian $40,000 in damages for an accident, but finds he or she was 30 percent at-fault, pedestrian would be awarded $28,000 in damages - $40,000 minus 30 percent. The GHSA report indicated there were more than 6,000 pedestrian deaths last year - the highest year on record in more than two decades. It amounted to an 11 percent increase in just a single year. Florida was the second-worst state for pedestrian deaths based on the fatality rate per 100,000 people (3.12). However, Delaware, the highest at 3.18, had 18 pedestrian deaths in the first six months of last year, compared to Florida's 301. Florida saw an increase of almost 9 percent from the first six months of 2015 compared to the first six months of 2016. As a percentage of total motor vehicle deaths, pedestrian fatalities spiked from 11 percent in 2015 to 15 percent in 2016. This increase is counterintuitive, given the fact that there has been an increase of awareness of pedestrians, numerous Complete Streets initiatives to help improve road conditions and vehicles that are designed to be safer. In terms of nailing down the causes, investigators first looked at walking miles, which were only up marginally. Researchers say the only major difference is the use of electronic devices, which has exploded in recent years. As a spokeswoman for the Active Transportation Alliance put it: "We are crazy distracted." Behind speeding and failure to yield, distraction is the No. 3 cause of all traffic accidents, and pedestrian accidents in Bradenton are no exception. The GHSA executive director told NPR there was long an assumption that the number of traffic deaths would go down with the advent of semi-autonomous vehicles. However, we're seeing the opposite. Pedestrians, much like drivers, are consumed with their smartphones, whether it's playing Pokemon Go or simply catching up on work or with friends. Still, the bigger problem remains the speed of vehicles. The National Safety Council reports a pedestrian struck at 20 mph has a 10 percent chance of dying, while a pedestrian struck at 40 miles an hour will have an 80 percent chance of dying. If you or a loved one has been injured in a car accident, you need representation to get the compensation you deserve. Contact our law firm today for a free case evaluation.